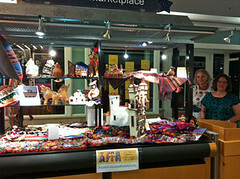 AFFA is dedicated to the knowledge, promotion and preservation of folk arts and world cultures. Our bylaws say AFFA “is organized and shall be operated [. . .] for civic, educational and charitable purposes related to the support, promotion, appreciation, and development throughout Austin and Travis County, Texas, of folk art from around the world.” Founded in 1987 by a small but enthusiastic band of culturally curious explorers, AFFA has carried out its activities as a non-profit educational organization in compliance with Internal Revenue Code 501(c)3 since 1988. Folk art comes out of a cultural tradition of hand-making functional objects that are necessary in everyday life–usually for utilitarian or religious purposes. Often the craft skills are passed down through families not considered schooled in art, yet some of these artists achieve a very high level of technical expertise and express a uniquely creative vision. This can make it difficult to draw a clear line between folk art and fine art. What is clear is that many artists develop outside the centers of academic training (a fact which in 1975 prompted Roger Cardinal to coin the phrase “outsider art”) and that even academically trained artists (like Picasso) find inspiration in the materials, techniques, vision and energy of traditional folk arts. AFFA’s definition of “folk art” is broad and flexible enough to embrace everything from urban mural art, Feng Shui and Southwest Petroglyphs to Moroccan fortune-telling, Oaxacan wood carving and Byzantine icon painting. And that doesn’t begin to describe the broad range of our interests, which really include any art by any folk!